Having children is at times a mountain to climb with hidden pitfalls waiting for us to slip up and fall on our faces. Yet, when we get back up, there is the most beautiful sunrise. We start again, we learn, improve, and adapt. There is no roadmap to the top of the mountain. We make our own path to parenthood. We can follow the directions from another parent, or heck, even our own parents, to find that path has washed away and is no longer passable, meaning those rules don’t seem to apply to my ‘one in a million’ unique child. 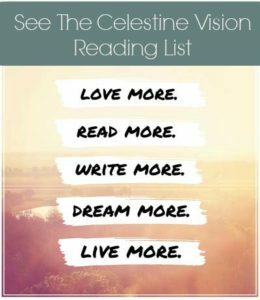 Reading The Celestine Prophecy has helped me to recognize the control dramas that play out, the exchange of energy between family members, and to remember to take time out to fill up my own energy. Children have a lot of natural energy! And we are giving them our energy so much of the time. 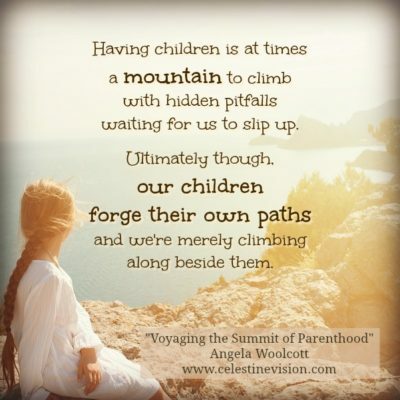 Ultimately though, our children forge their own paths and we’re merely climbing along beside them. In a loving relationship, we hold out a hand to help them back up again when they slip, and yes, definitely to help guide them away from those hidden pitfalls, ledges, and unsteady rocks with loving care. We want to keep our children safe; this is innate as we love and cherish them. Generally, we can all agree that discipline is necessary to keep children within the boundaries of what are acceptable healthy behaviors, and what are not. Sayings such as, ‘that child has them wrapped around their little finger’ or, ‘they just get away with everything’, play over in our heads, reminding us to keep our little ones under ‘our’ control. It’s helpful to remember that children are learning how to deal with their own emotions and learning how to treat others. Often, they feel overwhelmed with fitting in and feeling accepted, so they may go into overload or meltdown pretty easily. This isn’t always easy for parents to deal with. 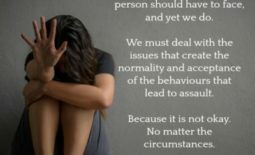 I certainly have been through many rough patches with my children where anxiety has taken over any attempt to calm them down as they explode in a myriad of emotions. (And I’m not just talking their anxiety here!) It has left me feeling utterly drained and deflated at times as I couldn’t foresee or prevent the impending cracker of a whopping meltdown! The Fourth Insight “The struggle for power”, reminds us that most conflicts between a parent and their child arise from a struggle for power. Walking away, having a deep breath or two…or twenty-five, is a good practice for any parent. Taking time to fill up our energy from a higher source and nature, to allow oneself to regroup, and to refocus before calmly dealing with an upset child is an investment in self, child, and our society – and an incredibly worthwhile effort. Our little mirrors are really projectors making their own story of the world. For a while we write, direct, and produce their journey up the mountain of life. Our roles change as they grow. I tell my children to be kind to others and believe in themselves but they learn most from our actions. They are audience members of the unfolding dramas of our life story and are smack bang at the centre of our focus so much of the time. I remind them that they are connected to the amazing divine energy of creation from within. When at peace in their favourite spot, this flows naturally to them as they will point out every butterfly and every rainbow and truly live in the present moment. Moving Through Restlessness Back Into The Flow	Love Yourself: You’re a Big Deal!